African elephants risk slaughter by poachers trying to obtain their tusks for the lucrative ivory trade. The bloody toll in elephant poaching continues to climb in Cameroon, where security forces reportedly killed a handful of Sudanese rebels suspected of slaughtering the animals for their valuable ivory tusks. FILE - In a U.S. crackdown,confiscated ivory was stacked for crushing in 2013 at a National Wildlife Property Repository in Commerce City, Colorado. Colonel Didier Badjeck, spokesman for Cameroon’s military, told VOA that security forces recently have engaged in gun battles with poachers in Bouba Njida National Park in the country’s north. Badjeck did not disclose the number of rebels killed, but local residents on Saturday reported seeing six human corpses. Approximately 20 elephants also have been killed in the immense park within the past two weeks. Sudanese rebels on horseback, armed with automatic weapons, are believed to have killed hundreds of elephants there in 2012, National Geographic reported last month. Cameroon’s government deployed its military to protect national parks in the north after they lost nearly 2,000 elephants between 2012 and 2013. The rebels are believed to be selling elephant tusks to fund their activity. A kilogram of raw ivory commanded $2,100 last year, up from $750 in 2010, according to Save the Elephants, a conservation group. The rebels used sophisticated weapons, some likely obtained from Libya, a country destabilized by civil war, said Jean Jacques Lebois, who works for the Economic Community of Central African States’ anti-poaching department and recently returned from a visit to the park. "Illegal wild life trafficking is considered to be the third or fourth biggest transnational criminal activity in the world, behind human trafficking, weapons trafficking and drugs trafficking,” Lebois said. He estimated the value of the illicit wildlife trade at $8 and $10 billion a year. "When you are talking about this much money, you combine it with an illegal activity, you have corruption," Lebois said. He added it exists "at every single level of this chain, which begins and ends in East Asia, but which transits through central Africa." 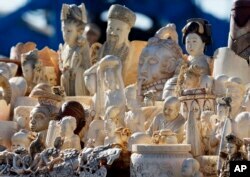 On Thursday, China – the world’s largest market for ivory – imposed an immediate one-year ban on importing the prized material, used for carvings, trinkets and utensils such as chopsticks. The country had been sharply criticized for fueling the illicit trade and spurring the slaughter of wild African elephants. The United States tightened its trade restrictions on ivory in last year, with specifics outlined by its Fish & Wildlife Service. Many armed groups in central African states are involved in wildlife crimes, said researcher Thomas Ewing of the Washington-based C4ADS, a nonprofit organization helping African countries uncover illicit networks of elephant poaching and illegal ivory trading. "I cannot tell you how much a terrorist group might make from ivory or the different types of terrorist groups involved in ivory trade," Ewing said, "but I can say that a wide range of destabilizing actors in different African states seem to be involved in this trade." International wildlife organizations blame rebel groups for the slaughter of almost 12,000 elephants in Central African countries since 2004. They say the rebels are working with corrupt government officials to sell the Ivory to Asia to finance their insurgencies. Villagers sometimes help poachers get rid of the elephants, which damage crops, National Geographic reported, citing a Cameroon government report.